Spain Brothers & Co. is an established firm of Chartered Accountants with offices in Canterbury, Dover and Folkestone, with over 100 years’ experience of working with businesses and individuals in South East England, with clients ranging from individuals and sole traders through to international groups of companies. 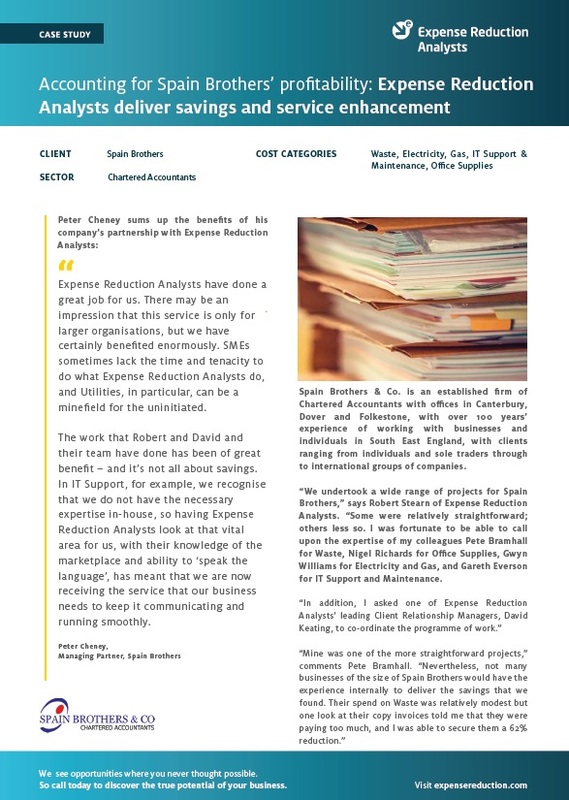 “We undertook a wide range of projects for Spain Brothers,” says Robert Stearn of Expense Reduction Analysts. “Some were relatively straightforward; others less so. I was fortunate to be able to call upon the expertise of my colleagues Pete Bramhall for Waste, Nigel Richards for Office Supplies, Gwyn Williams for Electricity and Gas, and Gareth Everson for IT Support and Maintenance. To find out more about how ERA helped Spain Brothers, including results, savings and more details from the client, download the full case study now.